The Project 885 nuclear submarine is the quintessence of everything the Russian military industrial complex has achieved in over half a century of building submarines. Large-scale construction of the next-generation Project 885 Yasen-class multi-purpose nuclear attack submarine, armed with Onyx supersonic cruise missiles has begun in Russia. The ships will compete with the latest American Seawolf-class nuclear submarines in terms of their noise profile and will be world leaders in terms of fire power. Moscow plans to acquire at least 10 of these boats by 2020. The fourth submarine in this class was laid down in Severodvinsk on the eve of Navy Day, which was celebrated on the last Sunday in July. The Project 885 nuclear submarine is the quintessence of everything the Russian military industrial complex has achieved in over half a century of building submarines. The vessel has a hull made from high-resilience low-magnetic steel, and so can dive to a depth of more than 600 metres (conventional boats cannot go deeper than 300 metres), which effectively puts it out of reach of all types of modern anti-submarine weapons. Its maximum speed is more than 30 knots (about 60 kilometres per hour). The nuclear submarine is equipped with an escape pod for the whole crew. The Russian designers say that the Yasen is not only quieter than the Project 971 Akula, but also quieter than the latest American Seawolf nuclear submarine. Moreover, unlike those vessels, the new missile submarine will be more functional thanks to the weapons at its disposal (several types of cruise missile and torpedo) and will be able to fulfil a wide range of roles at sea. 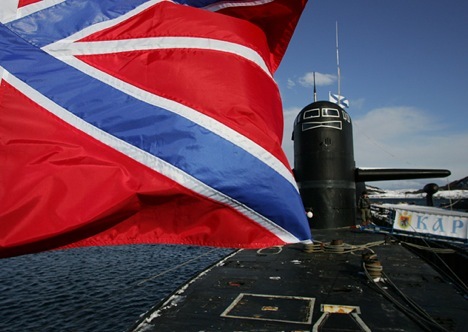 The Akula nuclear submarine is currently the most important of the Russian multi-purpose attack submarines designed for raiding operations against sea lanes. Virtually inaudible in the depths of the ocean, they are equally effective against transport vessels and warships, and can also hit the enemy’s coastal infrastructure with cruise missiles. Akula submarines were recently spotted within the 200-mile zone of the coasts of the United States and Canada, which caused a serious commotion among the countries’ respective militaries. Having discovered the presence of these ‘guests,’ neither of them was able to track their movement, which naturally caused serious concern. After all, the Akula carries on board 28 Kh-55 Granat cruise missiles, the equivalent of the American Tomahawk, which can fly 3000 km and deliver 200-kilotonne nuclear warheads to their targets. The main attack system on the Yasen is the P-800 Onyx, the latest Russian supersonic cruise missile. This missile is the base version for two absolutely identical export versions in terms of their appearance: the Russian Yakhont and the Indian BrahMos, although with significantly reduced combat characteristics. These devices are capable of being fired from under water. They fly at a speed of 750 metres per second and carry a devastating high-explosive warhead weighing half a tonne. They have a range of more than 600 kilometres. The Onyx is guided to its target by a navigational system that operates on target designation data, that is inputted provisionally to the missile before it is launched. At a predetermined point in the trajectory (25–80 kilometres), the missile’s homing device is briefly activated and determines the precise location of the target. The homing device is activated again after a sharp reduction in altitude of 5–15 metres, just seconds before it hits the enemy. This is to ensure that when the enemy detects the missile’s launch it cannot ‘jam’ the missile with electronic countermeasures. But it’s not its high speed or the protection of its homing device against electronic countermeasures that makes the Onyx a super-modern weapon. Once it is launched from the submarine, the missile finds the target by itself. After determining their coordinates, the missiles ‘wait’ until the last one is out of the launch tubes and then line up, just like a wolf pack, and begin to ‘home in on their prey’. The designers are not really advertising this point, but it’s the missiles themselves that decide which missile attacks which target and how. The missile ‘pack’ decides these targets, classifies them in terms of importance, and selects the tactics for the attack and the plan for its execution. In order to prevent mistakes, the missile’s on-board computer system is programmed with electronic data on all modern classes of ship. This is purely tactical information – for example, on the class of vessel. This enables the missiles to determine what they are up against, whether it be an aircraft-carrier or landing group, and then to attack the main targets within the group. The Onyx missile’s on-board computer also holds data on how to counter the enemy’s electronic warfare systems, which can divert a missile from its target, and systems for evading anti-aircraft defence systems. At the same time, like wolves in a real pack, the missiles themselves decide which one of them is the main attacker and which one must take the role of the decoy to lure the enemy’s aircraft and air defence systems away. Once the main selected target has been destroyed, the other missiles immediately redistribute the combat assignments between themselves and begin to destroy other vessels. There is no ship in the world that can dodge an attack by Onyx missiles. Yes, ship-borne radar systems can detect that they have been launched, but then further resistance is useless. The speed of these missiles and the way they constantly manoeuvre above the surface of the sea makes it practically impossible to intercept them with air defence systems or aircraft. Another advantage of the Onyx missile is that it can be used with various types of carriers. In Russia, it is installed not only in submarines but also on surface vessels and mobile land-based platforms – the Bastion shore-based missile systems. It’s the presence of these systems in Syria that so worries Washington today. Onyx will also be included in the weaponry of the Su-30MK family of fighters and the latest Su-34 frontline bombers. But the most important thing is that the next generation following the Onyx is already on its way. This is the Zircon, the first hypersonic combat missile system, for which testing is due to start next year.